Camshaft alignment tool 2 – BMW No.11 4 282. Camshaft alignment tool 3 – BMW No.11 4 283. Flywheel timing pin – BMW No.11 0 300. 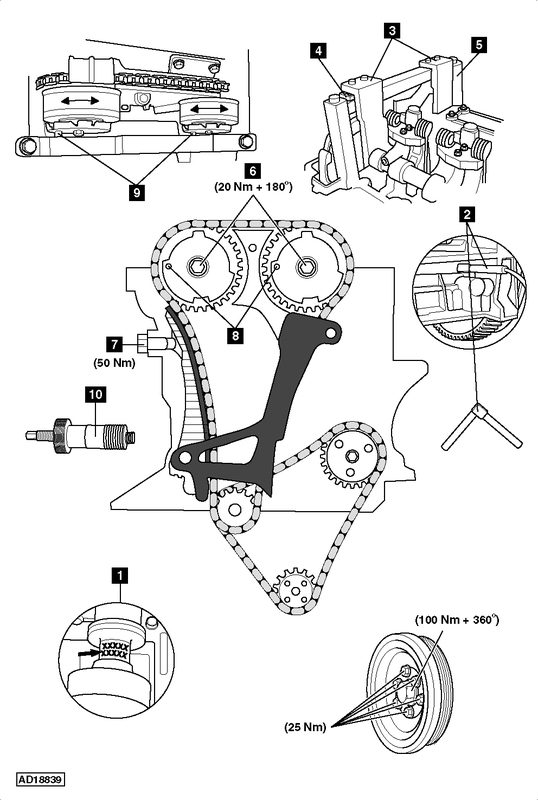 Sensor gear alignment tool – BMW No.11 4 290. Insert flywheel timing pin  . Tool No.11 0 300. NOTE: Engine should not turn if flywheel timing pin fitted correctly. Ensure camshaft alignment tools can be fitted  ,  &  . Tool Nos.11 4 281/11 4 282/11 4 283. Install sensor gear alignment tool and secure to cylinder head  . Tool No.11 4 290. Install timing chain pre-tensioning tool  . Tool No.11 9 340. Remove camshaft alignment tools  ,  &  . Install tensioner assembly  . Tightening torque: 50 Nm. Ensure flywheel timing pin and camshaft alignment tools can be refitted  ,  ,  &  .